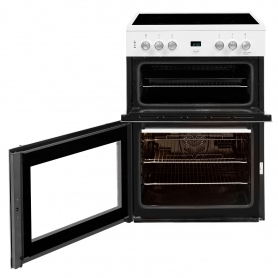 With a spacious double oven, this cooker offers plenty of room for creating large family meals. 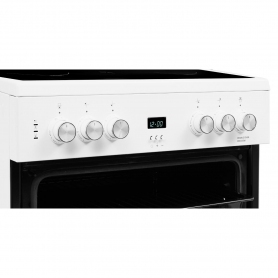 Combined with the ceramic hob and integrated grill, the EDC633W offers great cooking versatility. The 69-litre main fan oven and 36-litre conventional top oven with grill give you complete flexibility. Cook different elements of a roast dinner simultaneously, or use the top for grilling while the larger oven bakes dessert. Having so much cooking space makes busy family life that little bit easier. With a Fan Air Heating system in the main oven, even heat distribution will result in speedy oven heating and faster cooking. 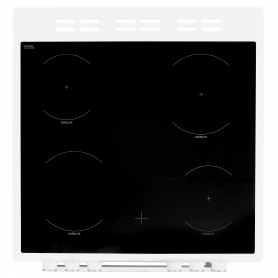 On top of the cooker, there’s an electric ceramic Rapidlite hob with four zones, which heat up quickly for fast and efficient pan heating. The hot hob warning lights will remain lit until they’ve reached a safe temperature, to help in preventing accidents. While the EDC663W offers a massive capacity, it also makes it easy to save electricity when you’re cooking for one. Crisp a pizza to perfection in the top oven, or make toast for breakfast in the full-width grill. To keep track of your meals with ease, the Beko Cooker also comes with a digital clock and countdown timer. Teatimes should no longer be a hassle, even when the kids demand different foods. The double glazed inner glass doors have been specially designed for easy cleaning, and the smooth ceramic hob simply wipes clean. 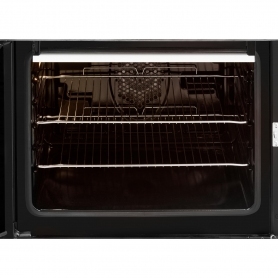 Inside the oven, there’s also an easy clean enamel lining. This ensures that any food or grease can be simply wiped away after cooking, saving you time and effort. 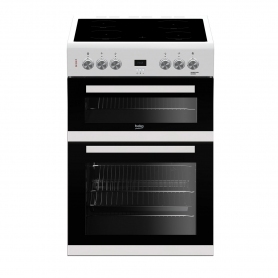 Both ovens have been rated an A for energy efficiency, meaning this is an electric cooker that can save money on your bills. The Beko EDC663W gives you everything you need to start cooking straight away. 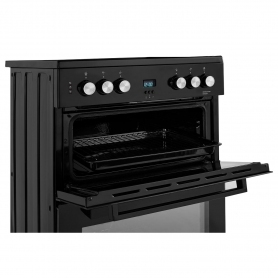 The grill comes with a pan kit, and the ovens come with three shelves between them – two in the main oven, and one in the top oven. This freestanding model, with a stylish and modern white design, easily slots into any kitchen. 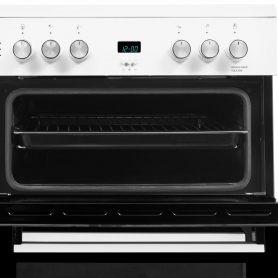 Beko consistently deliver great value for money, and this model is no different. 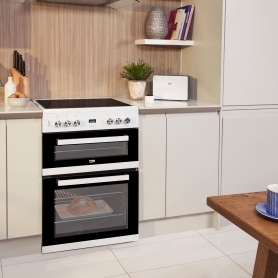 This cooker is the perfect practical addition to a family kitchen. Buy yours now!